There are some beautiful golf club sets out there to pick from, but which one is the best for your needs? You’ll have to consider a few factors as you shop to ensure you get something that is suitable for you and yet does not break your budget. We’re going to show you how to shop for the right set and ensure that you are happy with your choice. If you follow the guide we have detailed for you here, you will improve your game and have a well-rounded set of clubs. Now that we have covered what you should be looking for, it’s time to list some of the best golf club sets available. We chose these particular five sets based on the value they give you as a golfer, considering a range of budgets. Let’s start off with one of the highest quality golf club sets you can get. This only has 12 pieces, but you probably don’t need more than that, especially just starting out. 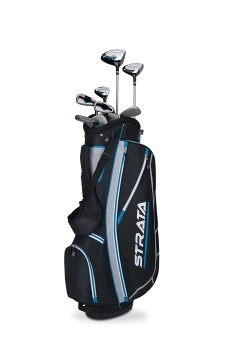 This is a kind of pricey set, but that’s because you are getting quality clubs all the way. Don’t mistake the kind of high price point for an inaccessible golf club set that only the pros can use, though. This one has a lot of forgiveness built in to make it appealing and usable for newcomers, and the quality of the clubs make it a great choice for professionals. The quality of the clubs. This one is a bit cheaper, and it is also not going to last you as long, in most cases. It can retail for under $200, and you get a full set of what a beginner needs to play with. This set is definitely geared toward the beginner, because it doesn’t include the harder to hit with sand wedge or 5 iron. You probably don’t need those starting out, but you can buy them separately without paying a lot of money. The included clubs will give you a diverse hitting selection and serve you well for a while. They should last you long enough until you are ready to move on to a more professional set. Designed with the beginner in mind. A great selection that skips the nonessentials. Not built to last for more than a couple years. Not made for professional golfers. Women typically need a different set of clubs than men- something that is lighter and shorter- and this fits the bill perfectly. 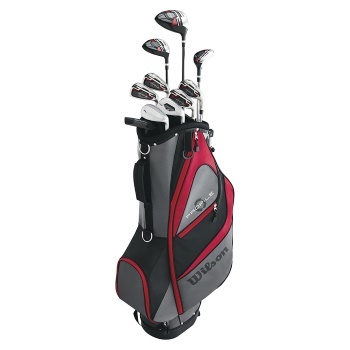 Despite the Callaway name, this one is priced affordably, at just over $200, and it includes 11 pieces, so it has a diverse enough selection to fit most players and most golf courses. The hybrid, wood and driver all have decent forgiveness that make them great for beginners, while the putter, irons and wedges all have excellent control and accuracy. 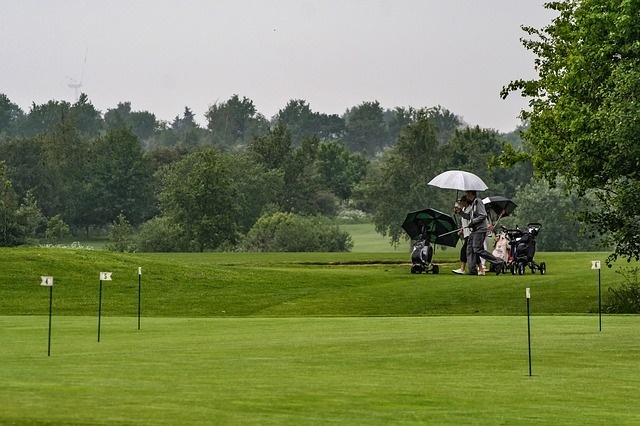 No matter how you play, there should be a club here for you that suits your handicap and play style. Great selection with a diverse lineup. Forgiveness and accuracy all in one set. Made primarily for female beginners, and that’s it. Wilson has another diverse set here that is comprised of a range of flex options for you. The graphite and steel irons should hold up for you for a long time, and the accuracy and control features are ideal for more experienced players. You won’t find a lot of forgiveness here, but if you are already decent at the game, then you will appreciate the excellent level of control offered by these clubs. Ideal for expected and mid-level players. Not so suitable for beginners. Let’s finish off with one of the highest value sets out there. 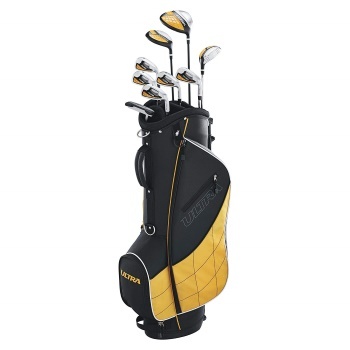 It retails for the same average price as many of these others- around the $200 mark, and it offers a range of high quality clubs that should last for several years, if you take good care of them. There may be some denting after rougher play, if you tend to use your clubs like sledgehammers when you hit, but generally, these are hardy clubs that will hold up well. You should know that this set is designed for the beginner, with larger-than-average club heads and plenty of forgiveness to go around. A lot of value for the cost. Pros won’t find much use out of these clubs. Perhaps you have heard the example given of a man who hires a contractor to build him a house and when he goes to see the completed house, he ends up with a house full of fine kitchens. Yes, the house is beautiful and each kitchen is wonderful, but it’s not something that he can live in. So too is a golf bag full of the same kind of golf club. Yes, you can find a wedge or a putter that you love and that can help you hit some of the more difficult shots accurately, but you can’t play a well-rounded game of golf with just one or two kinds of clubs. You need an assortment so that you can hit every ball in every situation, whether you are in the rough or in the green, whether you are making a long or a short shot toward the flag post. Certain clubs are use different situations. The angle of the head or wedge is what helps the ball get some loft or height, according to Livestrong.com. Each of your clubs should have a different angle on its head, and that will help you determine when to use each one. If you don’t have the right clubs in your bag, then you won’t be able to hit certain shots and won’t be able to get the distance you need with some of them. 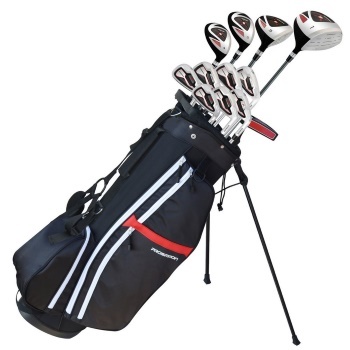 The Standard Set- Make sure that whatever set of clubs you buy has most or all of the standard ones in it. According to Golfweek.com, that would be a single driver, a sand wedge, a pitching wedge, a fairway woods and a 3-iron through a 9-iron. Once you have all these, then you will be able to hit most shots. You probably don’t need more than that if you are trying to play at a professional level, since you are only allowed 14 clubs on a professional course. The Price- There are some incredibly expensive golf club sets out there, and just because they are costly, that doesn’t mean they are the best choice. You can find some great golf club sets to fit with your budget, but you have to focus more on the reviews and the diversity of the sets than the price tag. Yes, the more expensive ones will likely last longer, but if you are just starting out with the game, you should go for the cheaper sets, since you will likely need to change out the clubs you are using later on, as you get better. Your Handicap– How well you play determines what kind of clubs you need. Professionals can get away with using a smaller set of clubs or clubs that are harder to control, but your handicap needs to come into play when you are picking clubs to determine what level of forgiveness is necessary, advises Global Golf. Dominant Hand- Make sure that whatever golf clubs you buy are made for your dominant hand. If you pay attention, you will often see choices for the right hand or the left, and you need to choose appropriately. 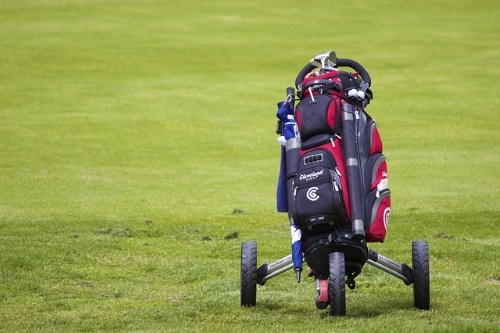 Buying More than You Need- Just because you are allowed to have 14 clubs in your bag for professional games does not mean that you have to fill out the entire 14. Just buy what you need and what you know how to use to start with and work your way up from there to avoid spending too much on clubs and to avoid buying clubs you don’t yet know how to use. Buying Professional Clubs- If you are relatively new to the game, then you should look for clubs with a high forgiveness level. This allows you to make shots more easily and miss shots less often. Yes, it sacrifices fine control for ease of use, but it will likely be worth it for you to have a more pleasant game. 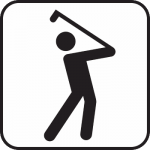 Buying Cheap– We mentioned earlier that you should not pay too much for your clubs, especially when you are first starting out, but you also want to avoid buying cheaply made clubs. Check the reviews to see what customers have to say about the quality of the clubs, and keep in mind that you can get good quality clubs for a good price, if you do some checking around. Buying the Wrong Flex- You also need to keep an eye out for the flex of the clubs. This determines how much give the club has when you hit with it, and if you buy something that doesn’t suit your playstyle, you will have a frustrating time of golfing. You’ve seen how the best golf club sets can make a difference in your game, and you know what to look for as well. Now, you should be able to pick out the right set for you. Maybe one of the ones we listed and reviewed here isn’t right for you. There are lots of other choices out there, and the tips we have given you in this article should help you to find the best one for you.